NO PURCHASE NECESSARY. You must be 18 or older and a legal resident of the 50 United States or D.C. to enter. Promotion begins August 1, 2011 at 12 a.m. ET. and ends September 6, 2011, 11:59 p.m. ET. Void in Puerto Rico and wherever prohibited by law. 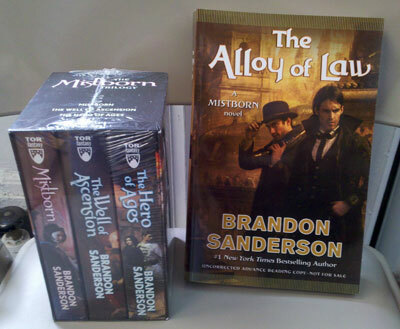 For Official Rules and to enter, go to tor-forge.com/tor/promo/mistbornprizepack. Sponsor: Tom Doherty Associates, LLC.